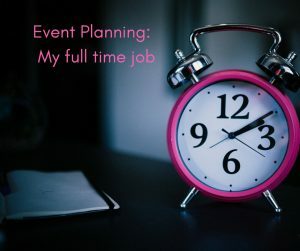 Event management is a full time job | Details! Rant ahead: Yes…this is my full time job. I feel event planners have battled this sentiment for years. My mother opened Details in 1988, we’re the oldest independent planning company in Calgary and for close to 30 years now I haven’t seen the industry really gain much traction in public perceptions. I make my living doing this full time. My kids are in a dayhome because I work 40+ hours a week most weeks and as I get closer to the events that 40 hours turns into 80-100. Which is all good, because I love what I do and I love the impact events make on the world. If you are looking to hire someone….if you’ve come across our website because you need help with your event, please make sure you’re hiring someone who does event planning as their full time job. Not a virtual assistant. Not someone who dabbles in event planning and who claims they can do it all. There are many different skills in planning a tradeshow versus planning a wedding. Some are the same, but a wedding planner isn’t developing an exhibitor prospectus and a tradeshow planner isn’t managing the emotions of the mother of the bride (or knowing where to go for pictures when it’s raining on your special day).